With China to the north and India to the south, Nepal sits between two cultures and two geographies. Eight of the world’s 10 tallest mountains fringe the land-locked nation’s northern border with the Tibetan region of China. It’s a trekking and climbing paradise with plenty of astonishing geography that poses challenges for the locals and tourists. 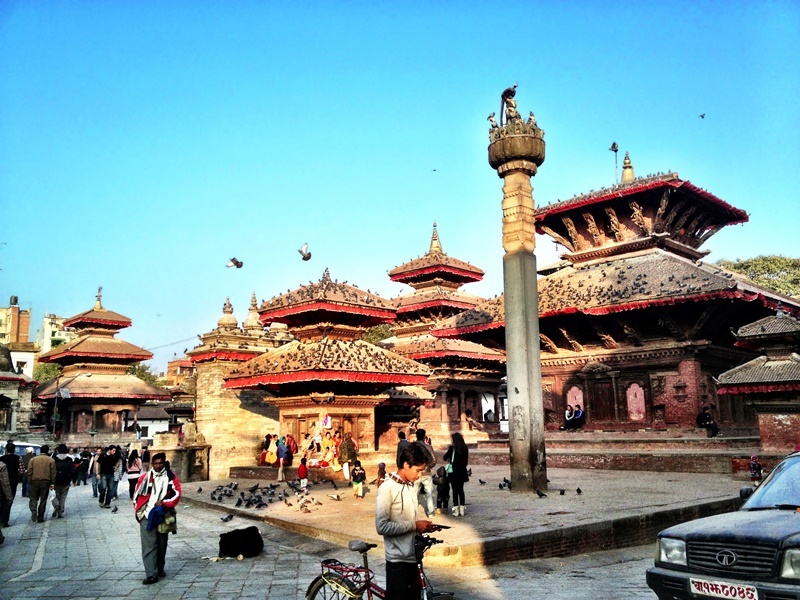 Getting to Nepal is easy, there are flights from many capitals including Bangkok, straight into the capital Kathmandu. From there, however, things get a bit more tricky as you have to navigate one of the most adventurous terrains in the world. You have plenty of local bus services with varying degrees of comfort and mechanical reliability. I’d vote for the many local small to mid-sized planes. I tried both. The Nepalese love their car and motorbike horns – you’ll hear plenty of them whilst getting around. Kathmandu is a city of some two million, not long into repairs following the traumatic earthquake in April 2015. There remains a lot of negotiating between the Nepal Government and NGOs on exactly how the world’s generosity should be spent. In the meantime many of the historic sites of old Kathmandu – the palaces, the town squares, the ancient temples – remain either closed, ignored, propped up with bits of timber and, generally, unloved. The Nepalese people are a hybrid of the cultures and countries around them and, even inside Nepal, there are a lot of smaller regions and tribes who, kept apart by geography, haven’t blended together as much as they would have with better transport and connections over the decades. The food, too, is equally diverse – certainly lots of Indian influences with curries and spicy dishes. I had no problem finding excellent food in most areas and didn’t have any tummy problems during the trip (I was prepared for anything!). The Nepalese speak English as a second language so communication was relatively easy and the locals were always eager to help. If you like climbing things then you’ve come to the right place. Pretty much, the only way is up in Nepal. Temples are poised atop hills with hundreds of steps to climb to reach them and the trekking will have you heading upwards over some of the thousands, yes, thousands, of hills to enjoy the views beyond. Most of the lower-area trekking will be in moderate to hot temperatures. It gets colder in winter of course but still within the limits of a normal wardrobe. It’s only when you get a bit more ambitious and look to the Himalayan mountains you’re going to need specialist guides, clothing and probably a lot of preparation. Highpoint’s (of the trip, not the landscape) were Pokhara and Chitwan, on a tourist triangle from Kathmandu with plenty of travel and accommodation options. Lumbini, the birthplace of Buddha, is also a popular destination in the same region. Pokhara is a lake town where it’s pleasant at 30°C in the summer as you stroll around the area or take one of the many boat trips around the Phewa Lake. Around the region are a lot of adventure and eco-tours: para-sailing, zip-lines, trekking, spelunking and white-water rafting. And the backdrop to all this, as you cast your eyes upward, are the jagged peaks of the central Himalayas. You’re looking at the top of the world, from the comfort of your moderate temperature zone and T-shirt. You feel like you can reach out and touch these soaring summits which draw adventure tourists and the truly ambitious to their slopes in ever-increasing numbers each year. Locally, the Nepalese are doing their best to find sustainable ways for the world to visit this unique attraction, whilst at the same time keeping it safe and accessible. 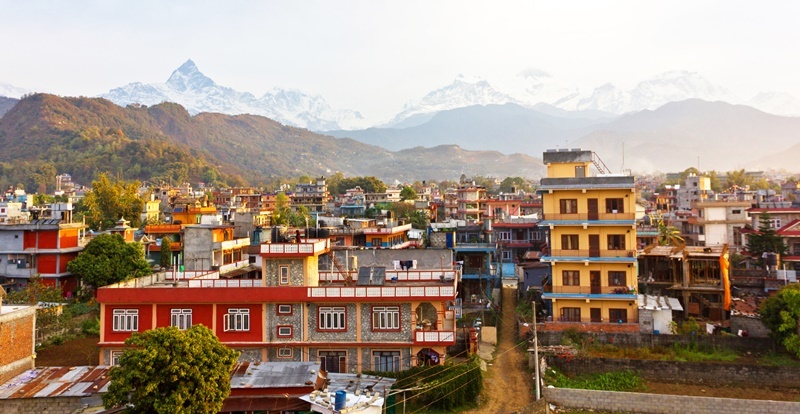 Nepal is a step off the regular tourist map. It will challenge and surprise you, either with its stunning geography, or some of the teeth-rattling bus rides you’re going to have to endure if you decide to get around on the cheap. Tim Newton travelled to Nepal with Thai Airways who fly to Kathmandu from Bangkok every day.